The March for Our Lives to end gun violence and mass shootings in schools is taking place in Washington, D.C. on March 24th — but 18 years earlier, another march with a similar goal occurred. The Million Mom March on Mother’s Day in 2000 was a rally for stricter gun control laws, but while these marches might have had similar intentions, gun control activists should hope for a better outcome when it comes to the March for Our Lives. As USA Today reported, the Million Mom March had 750,000 participants and support from people like Bill and Hillary Clinton and Rosie O’Donnell. Still, the publication noted that the Million Mom March did not lead to the results that organizers and participants had been hoping for, and the influence of the National Rifle Association (NRA) in politics has only grown since then. The NRA’s power in 2018 can be evidenced by the number of school shootings that only keeps increasing — but that’s exactly why another march to end gun-related violence is happening. Both the March for Our Lives and the Million Mom March were inspired by tragedy. For the March for Our Lives, the Stoneman Douglas High School mass shooting in Parkland, Florida, in which 17 people died, sparked the nationwide rally. And instead of moms, it’s students who are leading the charge. The Stoneman Douglas student group #NeverAgain and the gun control advocacy group Everytown for Gun Safety have organized the March for Our Lives, and there is something simultaneously heartbreaking and inspiring about teenagers who survived the shooting being the ones to passionately advocate for change. Another difference between the Million Mom March and March for Our Lives is the social media aspect of the current movement. Facebook, Instagram, and Twitter didn’t exist in 2000, but the world is more connected than ever now. By using social media, people around the country can participate in and show their support for March for Our Lives even if they can’t make it to D.C. or a local rally. Celebrity backing is another difference between the two marches. President Bill Clinton has shown support for both marches, but overall, famous people have been more supportive of the 2018 movement versus the 2000 one — which makes sense since the death toll due to gun-related violence has only increased since then. O’Donnell was a speaker at the Million Moms March, and there will be multiple performances by huge artists like Lin-Manuel Miranda and Demi Lovato at the March for Our Lives. While you can debate how effective marches really are when it comes to making lasting change, as USA Today did in its article, the aftermath of the Million Mom March shouldn’t stop the momentum that people are feeling right now for gun control. And other original Million Mom Marchers are supporting March for Our Lives too — particularly moms who marched in 2000 who now have children marching in 2018. Canandaigua March for our Lives is this Saturday at FLCC. Meet 9:30 at the library flagpole. I attended the Million Mom March in 2000 at the National Mall. Can’t believe we’re still doing this. Columbine. Newtown. Parkland. And so many more. Enough. @SenatorLeahy @SenSanders @PeterWelch take notice ... my children have been raised in a society where death by automatic weapon in safe spaces is the norm. They will not be quiet, and I intend to hold the megaphone. Our children are on their way. Be ready to listen. @Lawrence -Million Mom March on Mother’s Day 2000 was first & largest gun violence protest in U.S. history. We marched again in 2004 to renew the assault weapons ban. March For Our Lives will be 3rd march on this issue. 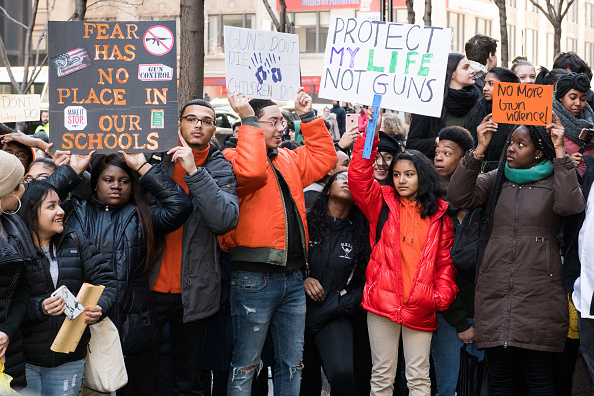 Gun control won’t happen unless people — like these students around the country — stand up for what’s right. So while the Million Mom March might not have had its intended effect, these teen advocates who have survived gun violence can lead this movement to lasting change. And the original participants of the Million Mom March will be right by their side as the next generation continues their advocacy that began 18 years ago.